Egypt on Saturday completed the first trial run of its "new Suez canal", officials said, ahead of the formal inauguration of the shipping route next month. 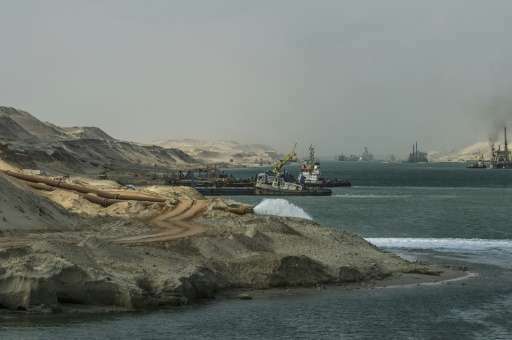 Dubbed the Suez Canal Axis, the new 72-kilometre (45 mile) project built by the Egyptian army is aimed at speeding up traffic along the existing waterway by reducing the waiting period for vessels, as well as boosting revenues. 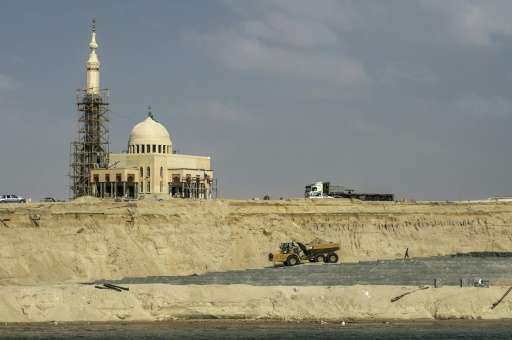 It will run part of the way along the existing canal that connects the Red Sea to the Mediterranean. "Today, we made sure that vessels with a draught of 66 feet" are able to use the new waterway, said Captain Mohamed Fawzi of the Suez Canal Authority, dubbing the first trial run a "success". Officials said six vessels in two fleets of three each crossed through the expanded canal as part of the trial run. One fleet sailing from south to north had vessels flying the flags of Singapore, Luxembourg and Bahrain. The second, sailing from north to south, had flags from Liberia, Singapore and Hong Kong. Fawzi said that the expansion means the waiting period for ships will be reduced from 18 hours to 11. The new waterway involves 37 kilometres (23 miles) of dry digging and 35 kilometres of expansion and deepening of the Canal, in a bid to help speed up the movement of vessels. President Abdel Fattah al-Sisi launched the project in August and set an ambitious target of digging the expanded canal within a year. A ceremony will be held on August 6 to officially inaugurate the project. The canal is part of an ambitious plan to develop the surrounding area into an industrial and commercial hub that would include the construction of ports and provide shipping services. The new route is considered a "national project" that aims to kick-start an economy battered by years of political turmoil since the ouster of president Hosni Mubarak in 2011. Authorities raised $9 billion (7.9 billion euros) to build the new canal by selling shares in the project to domestic investors, with private Egyptian companies tasked with its construction. It is expected to more than double Suez revenues from $5.3 billion expected at the end of 2015 to $13.2 billion in 2023, according to official estimates. Built 146 years ago, the Suez Canal is one of the world's most heavily used shipping lanes and a key source of international trade.